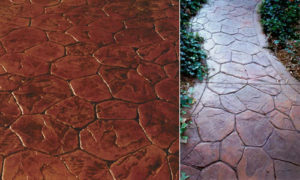 Stamped concrete gives the illusion of real stone, bricks, flagstones, tiles, etc. Also called textured concrete, we imprint your concrete with your choice of stamp/textured pattern. With so many different patterns and designs, that’ll give your outdoor project a professional and eye-pleasing look. 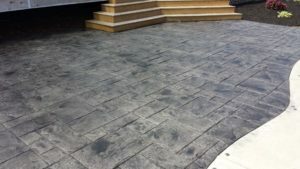 With stamped concrete you can achieve the same expensive appearance for far less the cost. 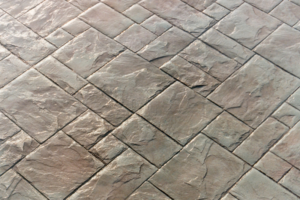 You can choose from a variety of shades and hues for your stamped concrete. The coloring agents are mixed into the concrete. A secondary color is applied next to make it look like real stone. Then two coats of sealer are applied for protection and a high gloss look. 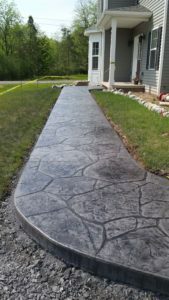 Harsh freeze-thaw climates typical to upstate NY and the surrounding regions will crack stamped concrete. 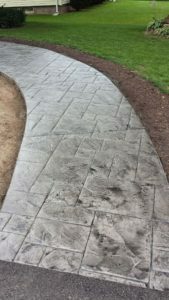 A skilled stamped concrete contractor will take advantage of well-placed saw cut control joints. Control joints are cut across the concrete to allow for movement for expansion and contraction during summer/winter months. Cutting control joints let us control where the concrete cracks and helps hide unsightly cracks from appearing on the surface of your stamped concrete. Make your patio or outdoor garden resemble a quaint English street. 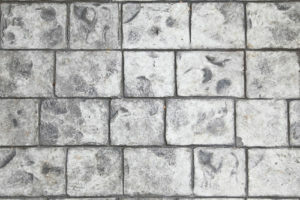 London Cobble stamped pattern has a traditional, rigid appearance (similar to a brick wall or cinder block basement). Each “brick” has slightly rounded corners and a somewhat domed surface. In traditional architectural fashion, they are layed in a staggered pattern with deep smooth joints. Each block is 6 in. by 8 in. London Cobble creates an enchanting walkway for any location. Grand Ashlar Slate takes an innovative spin on traditional slate patterns. The pattern is composed of multiple squares and rectangles in a seemingly random configuration. A popular choice for patios and sidewalks. The individual blocks range in size from 6” X 6” to 12” X 24”. You can choose from many different color options and accent colors. Create a formal entryway for both your home and outdoor recreation area. Random flagstone stamped concrete gives the appearance of natural stone by mimicking color and texture as well as individual stone shape, size, and placement. Random flagstone stamped concrete blends the beauty of natural stone with the longevity of concrete. Random flagstone is especially popular for pool areas, fire pits, and patios. Don’t see the decorative stamped concrete pattern you were hoping for? Contact us for more options! © 2019 All County Paving.